If you have been diagnosed with vitamin B12 deficiency this app will help you to keep your ‘B12 world’ organised and stress free. It will help you evaluate your condition accurately and build an important record of how B12 deficiency affects you on a day to day basis. This app will help to demonstrate to your doctor how well you are responding to treatment. Use the handy tools to chart your symptoms (symptom list provided with kind permission of Sally M. Pacholok R.N. & Dr. Jeffrey J. Stuart, authors of 'Could It Be B12 An Epidemic of Misdiagnoses? '), injections, supplements and medications and track improvements or regression in your health. You can print your charts directly from the app. Is your memory affected by B12 deficiency? Many of us have memory problems caused by the condition. We might forget appointments or when to take our medications and supplements. Reduce anxiety and become organised by setting this app to give you handy reminders and alerts. • My Symptoms - Use the slider bar to record the severity of your symptoms. Once entered and graded your results appear in graph form, alongside your supplements and medications. • My Supplement/Medications - Organise and manage your injections, medications and supplements. 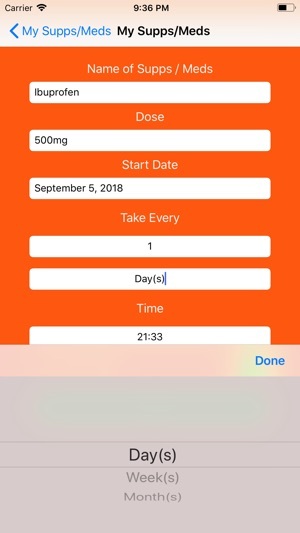 Let the app remind you when to take your dosage. 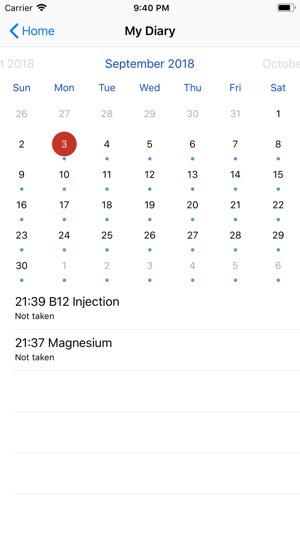 • My Calendar - Click any date to view doses for that day. Keep your current supplements/medication and appointments scheduled at your fingertips. 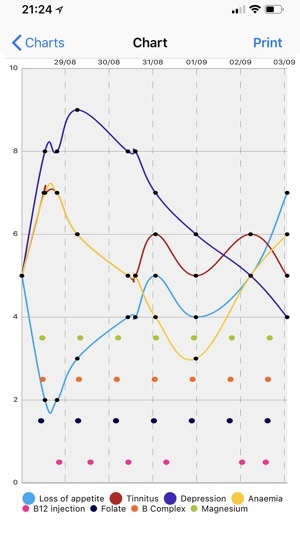 • My Charts - Choose up to four symptoms and medications to view at one time, and the graph will display improvements or regression. You can print them directly from the app. • My Journal - Record your observations and keep notes. Say how you feel! • My Test results - Keep your important test results accessible, and monitor changes over time. • My Medical History - Record key information regarding your B12 deficiency and any other conditions you have. • My appointments - The app will remind you of your scheduled appointments. • My Images - The camera never lies! Build and organise a personal image library of your visible symptoms to record your B12 history. Please note: The information on this app is not intended or implied to be a substitute for professional medical advice, diagnosis or treatment. This app is for informational purposes only. Always consult your health care provider regarding specific medical questions or concerns. We have made the app look better on the iPad and squashed some bugs. When I first got the App, I wasn’t too impressed, there was some bugs and glitches. Now though, after I’ve updated it it’s brilliant. Lots of useful features. You can type in your symptoms, there’s a journal if you want to do a daily diary. You can type in all your meds and supplements and in the calendar it reminds you to take them...A few other things like inputting test results etccc. Very handy App. 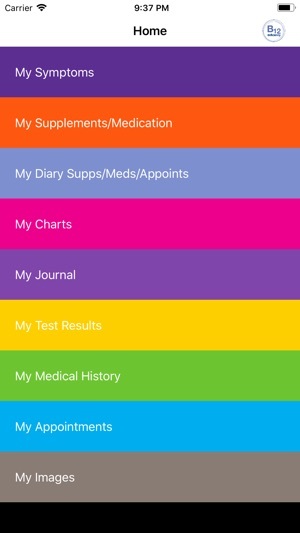 This is a really useful app - simple to use, keeping a record of my meds and symptoms is really easy. Being able to print my charts straight from the phone is great too! I have been using this app for a while and find it very helpful. The charts and the reminders are great but for me the image section is brilliant. To be able to keep all my info in one spot is invaluable.